Warning: Overhead chains and or the use of another lift truck should never be used as a main support apparatus. Under no circumstances should a forklift jack be used as a main support apparatus. Do not work under equipment that is not properly blocked and supported under the main frame of the unit. Be sure the support apparatus are on solid ground. Do not attempt to support equipment that is on gravel or crushed stone. Be sure the support apparatus has the proper capacity for the job. Never use floor jack as main support apparatus. Never use over head chain as support apparatus. Do not slide wooden blocking through hands. Never stand on, place feet under or straddle blocking. When positioning blocking under a lift, use a hand-hook or bar if possible to properly place blocks ensuring your body parts are clear of pinch points. Use proper lifting techniques. When blocking a forklift, never place blocks under a counterweight to support unit. Place blocking under frame of use V-blocks. Place load across grain of the block. Never place load on the end of the block. Do not stack blocking more than 2 high creating an unstable condition. Stack to obtain desired height only. Blocking used in conjunction with jack stands should be kept to a minimum. · Never use a wooden pallet or any piece of a pallet as support apparatus. · All stands should meet the following standards. · Wood blocking used in conjunction with jack stands should be avoided if possible. · Before removing the mast and drive axle, put blocks under the counter weight so that the lift truck will not tip backward. · Before removing the counter weight, put blocks under the mast assembly so the lift truck will not tip forward. The surface must be solid, even and level when the lift truck is put on blocks. Make sure that any blocks used to support the lift truck are solid, one-piece units and meet regional safety standards. Put a steel plate on top of the block. Note: Some lift trucks have lifting eyes. These lifting eyes can be used to raise the lift truck so that blocks can be installed. WARNING! The lifting eye should never be used as the main support apparatus. 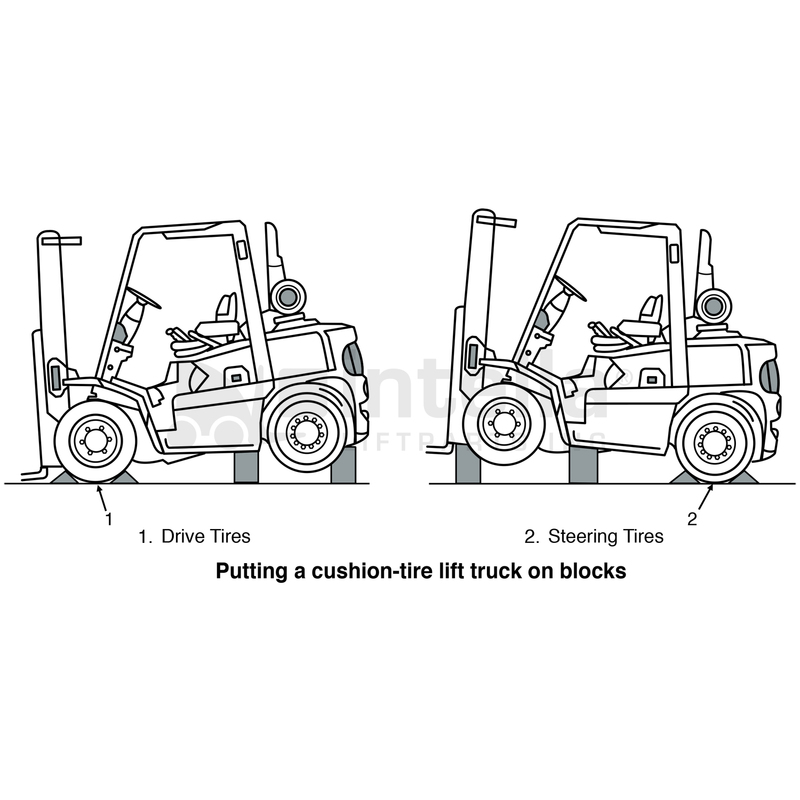 · Place blocks on both sides (front and back) of the steering tires to prevent movement of the lift truck. · Place the mast in a vertical position. Put a block under the mast channel. · Tilt the mast fully forward until the drive tires are raised from the surface. 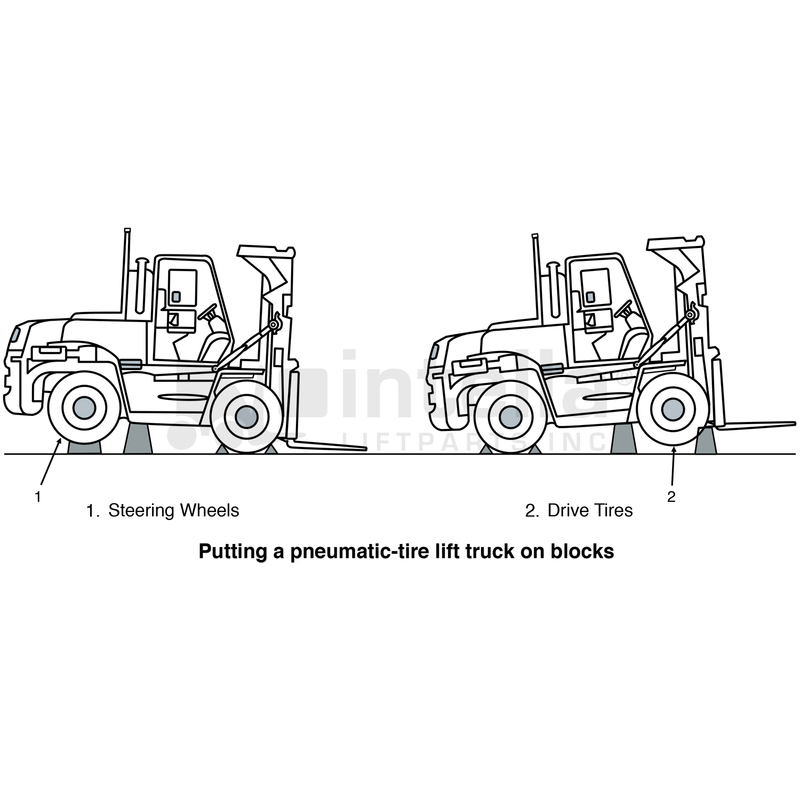 · Place additional blocks under the frame behind the drive tires. Make sure the blocks are under the frame and not the hydraulic or fuel tanks. · If the hydraulic system will not operate, use a hydraulic jack under the side of the frame near the front. Make sure that the jack has a capacity equal to at least 1.5 times the weight of the truck. See the capacity plate if you are unsure of the truck weight. · Apply the park brake. 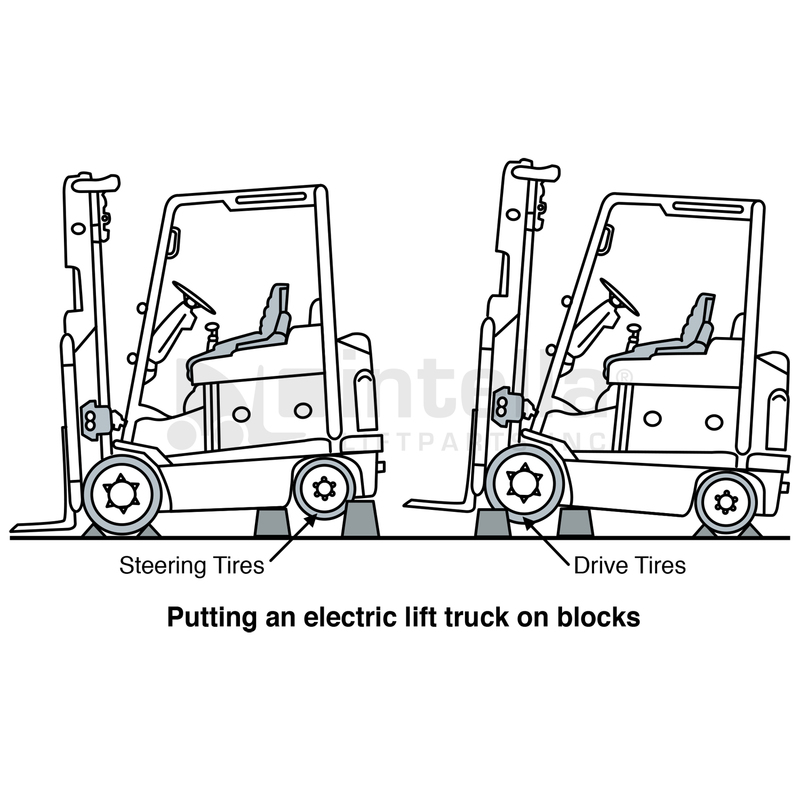 Place the blocks on both sides (front and back) of the drive tires to prevent movement of the lift truck. · Use a hydraulic jack to raise the steer wheels. Put the jack under the steer axle and frame to raise the lift truck. Make sure that the jack has a capacity of at least 2/3 of the lift truck total weight as shown on the capacity plate. · Place blocks under the frame and counterweight to support the lift truck. Make sure the blocks are under the frame not the fuel and hydraulic tanks. The surface must be solid, even and level when the lift truck is put on blocks. Make sure that any blocks used to support the lift truck are solid, one-piece units and meet regional safety standards. Put a sleet plate on top of the block. · Apply the park brakes. Put blocks on both sides (front and back) of the drive tires to prevent movement of the lift truck. · Use a hydraulic jack to raise the steer wheels. Make sure that the jack has a capacity of at least 2/3 of the total weight of the lift truck as shown on the capacity plate. · Place the jacks under the frame to raise the lift truck. Put blocks under the frame and counterweight to support the truck. WARNING! The jack should never be used as the main support apparatus. Do not put the truck on blocks if the surface is not solid, even and level. 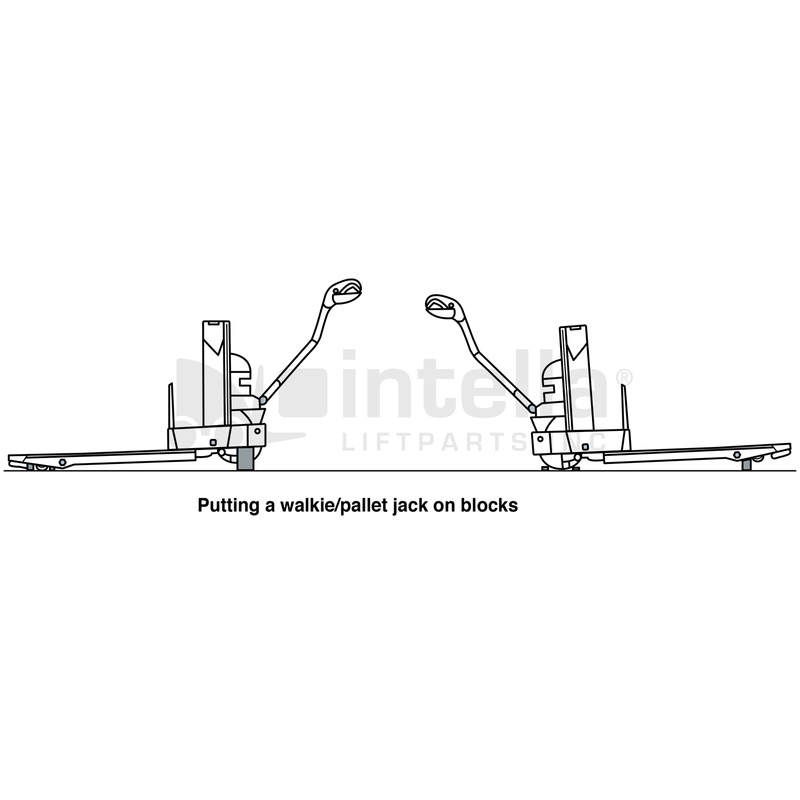 Make sure that any blocks used to support the lift truck are solid, one-piece units. Put a block in front and back of the tires that are touching the ground to prevent movement of the truck. Do not raise the lift truck by attaching on overhead crane to areas that will be damaged. Some of these points are not designed to support the weight of the lift truck. The lift truck can be damaged or it can fall on someone causing serious injuries. · Release the brake pedal to apply the brake. Put blocks in front of and behind the drive/steer tire and the caster wheels to prevent movement of the lift truck. · Use an overhead crane and web sling under the outriggers and the mast, to raise load wheels. Another lift truck can also be used to raise the outriggers. Make sure that the crane and sling or the other trucks has a capacity of at least 2/3 the total weight of the lift truck as shown on the capacity data plate. · Raise the outriggers only enough to suspend the wheels. 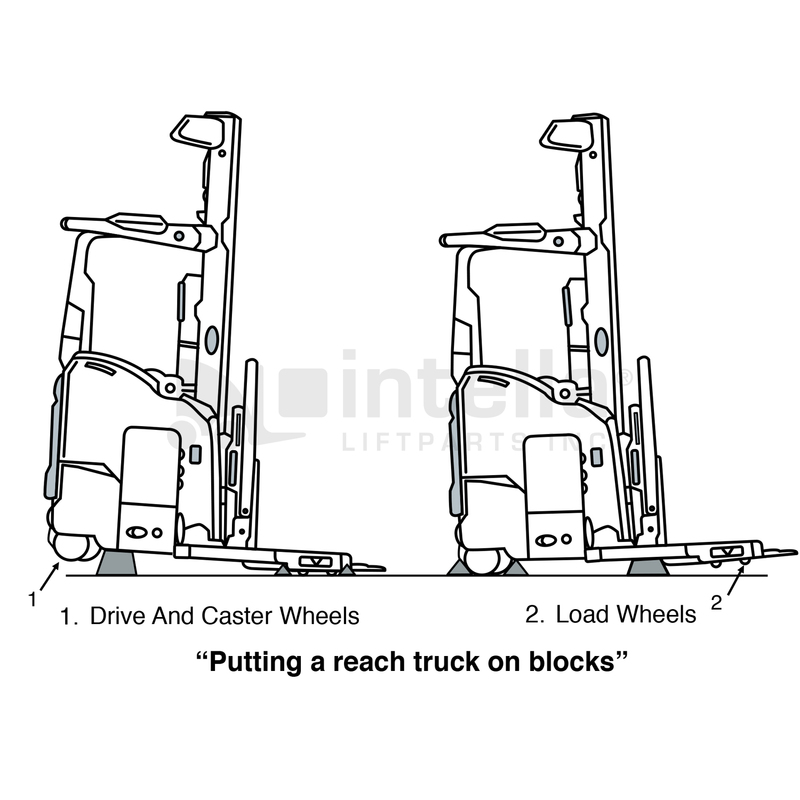 Install blocks under the outriggers at the rear of the wheels to support the lift truck. · Put a block on each side (front and back) of the load wheels to prevent movement of the lift truck. · Use a special low clearance hydraulic jack, crane or another lift truck to raise the drive, steer tire and caster wheel. Make sure that the jack or other lift truck has a capacity of at least 2/3 the weight of the lift truck as shown on the capacity plate. 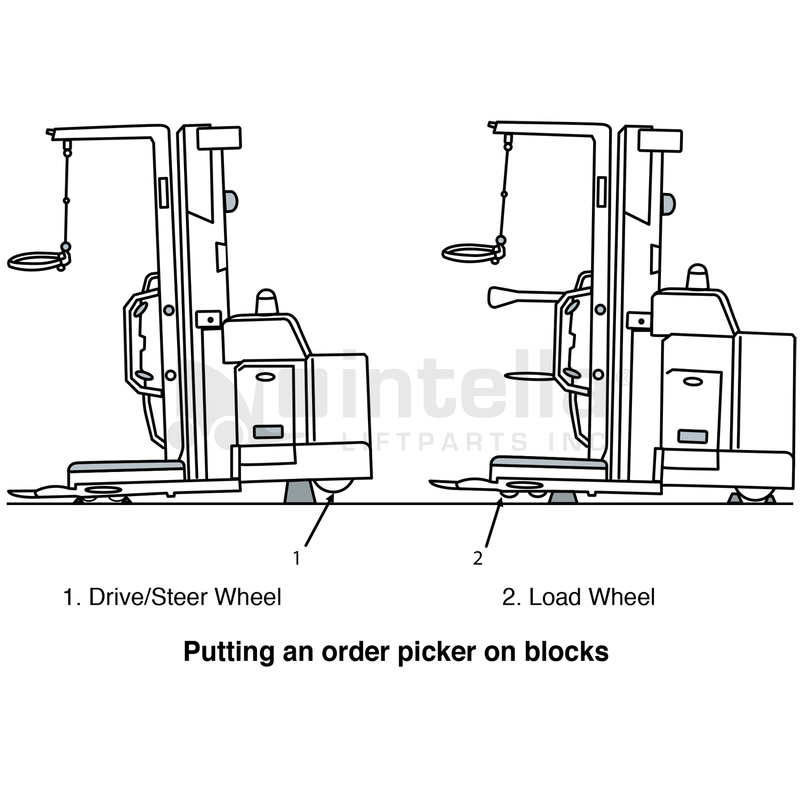 · Raise the lift truck only enough to suspend the drive and steer tire and caster wheel. Install blocks under the rear of the frame to support the lift truck. · Use a special low clearance hydraulic jack, crane or another lift truck to raise the drive, steer tire and caster wheel. Make sure that the jack or other lift truck has a capacity of at least 2/3 the weight of the lift truck as shown on the capacity plate including the battery. · Release the brake pedal to apply the brake. Put blocks in front of and behind the drive tire to prevent movement of the lift truck. · Use an overhead crane and web sling under the outriggers and the mast, to raise load wheels. Another lift truck can also be used to raise the outriggers. Make sure that the crane and sling or the other trucks has a capacity of at least 2/3 the total weight of the lift truck as shown on the capacity data plate including the battery.